US, 1943, 127 minutes, Black and white. Humphrey Bogart, Raymond Massey, Alan Hale, Julie Bishop, Ruth Gordon, Sam Levene, Dane Clark. 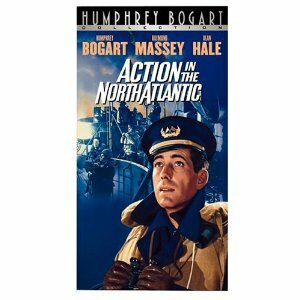 Action in the North Atlantic was one of many propaganda films made by the major studios during the early '40s. This had Warner Bros. production values, star cast and large scale special effects to highlight the impact of the war experience. Humphrey Bogart is at home in this kind of action film. Raymond Massey is stern as ever as the captain of the ship. There are small parts for the leading ladies, Julie Bishop and, in a rare screen performance at that time, Ruth Gordon. There is some comedy from Alan Hale and some tense melodramatics from Dane Clark. The focus of the film is the Merchant Marine Corps, its heroism in the face of action in the Atlantic and the carrying on of trade and supplies during the war. The film has a strong confrontation between Germans and Americans, intense as in Bogart's subsequent propaganda film Passage to Marseilles. Direction is by Lloyd Bacon, veteran director of many films at Warner Bros., including musicals, comedies and dramas. 1. The impact of the film as entertainment? War action drama? Propaganda? Its success in the '40s? In retrospect? A good example of the Hollywood war effort? 2. Warner Bros. big-budget production values: black and white photography, American locations, seagoing locations? The special effect work in the Hollywood tanks for the action drama in the Atlantic Ocean? Bombings, explosions, ships sinking? Editing and pace for the special effects? The rousing score? 3. The stars and their contribution to the war effort? The film as a Humphrey Bogart vehicle? 4. The focus on the Merchant Marines, their function during the war as in peacetime, their skill as sailors, the ships, the need for carrying supplies? The recruits and the crew? Loyalties? The dangers of war and the sinking of ships? Their treatment by the Germans? Their patriotism and the desire to go out, continue the service, avenge the death of comrades? The war spirit of the plot? 5. Joe Rossi as typical American sailor? Humphrey Bogart's style? Heroism in action, friendship with the captain, relationships with the rest of the crew? The experience of the bombing and the sinking of the ship? Survival in the North Atlantic? The return to New York? The visit to the bar? The encounter with Pearl, standing up for her and fighting with the interjector? Falling in love, the sudden marriage? The return to service? The confrontation with the Germans and Joe's patriotism and vindictive revenge? 6. Steve and his work as captain, career, the Merchant Marines and loyalty, working with his crew, friendship with Joe? The attack, the sinking by the Germans? His helping his men to survival? His relationship with his wife and the scenes at home? The return to the sea, success? 7. The sketch of the crew? their work, heroism, ordinary men in the service of their country? O'Hara and the comic touch? Dane Clark's intensity, seeming cowardice, not wanting to go, his return to the ship? The film's concentration of details of ship life and the relationships between the men? Comradeship? Heroism? 8. The sketch of the women, the human touch with the singer and her marriage, the loyal wife? 9. The portraits of the Germans - in war, the vindictiveness of the submarine crew, the cruelty in destroying the ship and killing the merchant sailors? The tension of the submarine submerged, the confrontation with the ship? Surfacing and destruction? The sketch of the German characters, caricatured for propaganda purposes? The sudden violence of the deaths? 10. War themes? The memories of World War Two? The just war? The American effort? The intensity of emotion and loyalty?